NACSW is the oldest governing body in Nosework, established in the mid-2000s. K9 Nosework was created by professional detection dog handlers and trainers: Ron Gaunt, Amy Herot and Jill Marie O’Brien. UKC was the second organization to become a sanctioning body for nosework trials. Official trials are set to begin after January 1, 2015. The SDDA is the first Canadian sanctioning body for nosework. Established in 2013, their first trial in western Canada took place in October 2014. ACSW is the only governing body for K9 Nosework in Australia, established by Marion Brand of K9 NoseTime (www.k9nosetime.com) in November 2014. The ACSW is the only official sanctioning and organizing body for K9 Nose Work® titles and ORTs in Australia - see acsw.com.au. There are three titles available in the sport of K9 Nosework. NW1: Passing this titles shows a proficiency in one odor (birch). There are four elements (container, interior, exterior, vehicles) with one hidden odor in each element. NW2: Passing NW2 shows a proficiency in two odors (birch and anise). There are four elements (container, interior, exterior, vehicles) with one- two hides in each element (number of hides will be stated for each element. The container search will contain at least one distractor (food, toys etc.). NW3: A title in NW3 shows a proficiency in three odors (birch, anise, clove). One-three hides may be in three of the elements (containers, exteriors and vehicles). Interior hides may have 0-3 hides, a room without hides is a blank room and must be called 'CLEAR' to finish the search. NW3 Element Titles:This is given after a team has successfully passed one element at NW3 level, three times. An example would be, passing an NW3 vehicle search at three separate trials, would earn a NW3-V title. A dog who passes NW3 is considered to be at the level of a professional detection canine. Element Specialty Titles: These specialty trials focus on one or two elements, they offer longer searches and/or multiple searches which are unique or challenging. Harry Award: This award is presented to a rescue dog who passes NW1 and shows 'extraordinary ability and spirit in K9 Nosework'. Sporting Detection Started- SD-S: There is one odor (Wintergreen) used in this level. Three elements are used (container, exterior, interior), with one hide in each element. Sporting Detection Advanced- SD-A In this level there are two odors used (Wintergreen and Pine). The same three elements are used in this level (container, exterior, interior). Two hides are in container and interior searches and one hide is in the exterior search. One distractor (food or toy) will be in the container search. Sporting Detection Excellent- SD-E Three odors are may be used at this level (Wintergreen, Pine and Thyme). Container and interior searches will include three hides, exterior searches will include two hides. One distractor (food or toy) will be in the container search. All three governing bodies use the same elements. An element is a specific type of search area used in nosework. Interior hides can take place anywhere indoors but they are often seen in classrooms, like the one pictured. The interior building search takes place on the inside of any building. Some searches are only one room, some searches can contain multiple rooms. There is often an option for the search to be done on or off-leash. Exterior area search takes place outside, often it contains grass, dirt, cement and/or gravel. 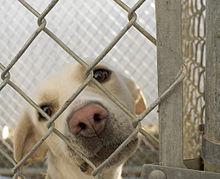 These searches can be especially difficult for the dogs as there are a number of new smells (trash/food, animals, etc.) the dogs are working in all weather conditions and the dogs may be tempted to mark or eliminate. Vehicle searches are usually 3 or more vehicles. The hide is always on the outside of the vehicle. The types of vehicle used varies from compact cars to horse trailers to semi-trucks. The types of containers used vary depending on the level. Beginning levels use plain, white cardboard boxes. More advanced levels use luggage, plastic bins, etc. Containers may be arranged in a pattern or randomly on the floor, or they may be placed up on chairs in a higher level. The odor used is a specific scents that dogs are hunting for. Unlike many professional detection dogs, all odors used in nosework are legal to carry and own. Each governing body sets their own standard for which odors are the target odors and what levels they are paired with. The odor is often dripped on a cotton swab, which is then hidden in a search area. At NW3, all three of the target odors can be used on their own or mixed to create a unique combination odor. NACSW also offers a shelter dog program, which provides enrichment and behavior rehabilitation for canines. Some of the positives offered by this program include 'natural physical & mental exercise, can be done with limited resources, confidence building for timid or shy dogs, redirection for rough and high energy dogs, build focus for unfocused and aroused dogs'. NACSW allows dogs in rescues or shelters to compete in NACSW events free of charge. Nosework is a relatively new sport so little research has been done on it as a behavior modification tool. A paper was presented at the 2011 American College of Veterinary Behaviorists and American Veterinary Society of Animal Behavior symposium, by Dr. Valli Parthasarathy on using nosework as a behavior modification protocol. One pilot study has been done to see if human perceptions of canines change after a nosework class. Some anecdotal evidence suggests nosework has helped dogs with behavior problems. Canines with a fear of humans can work and be rewarded in an environment with people around, but the dogs are not forced to interact. In nosework dogs are worked one at a time, so canines with dog aggression are able to have fun without other dogs in close proximity. There can also be an increase in time spent with the dog, while participating in nosework. Research has shown that even a slight increase in time spent interacting with your dog, will decrease the dog's separation anxiety, improve obedience and help form a stronger human-canine bond. ^ a b "Titles & Awards". ^ "K9 Nose Work® Shelter Project". ^ Association of Pet Dog Trainers Foundation. "Research Poster Presentations 2014". ^ Clark, G. and Boyer, W. (1993). The effects of dog obedience training and behavioural counselling upon the human-canine relationship. Applied Animal Behaviour Science, 37(2), pp.147-159. This page was last edited on 4 October 2017, at 13:13 (UTC).